An automated external defibrillator (AED) is a portable automatic device used to restore normal heart rhythm to patients in cardiac arrest. 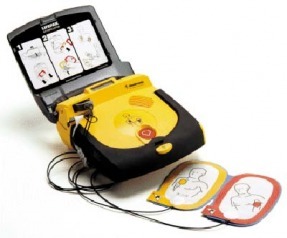 An AED is applied outside the body. It automatically analyzes the patient’s heart rhythm and advises the rescuer whether or not a shock is needed to restore a normal heart beat. If the patient’s heart resumes beating normally, the heart has been defibrillated. Today, AEDs are found in many places, including: government offices, shopping centres, casinos, hotels, sports stadiums, schools, community centres, airports, etc. The location of a public access AED should take in to account where large groups of people gather, regardless of age or activity. The fact that children as well as adults may fall victim to SCA should also play into the placement of the AED. Typically, an AED kit will contain a face shield for providing a barrier between patient and first aider during rescue breathing; a pair of nitrile rubber gloves; a pair of trauma shears for cutting through a patient's clothing to expose the chest; a small towel for wiping away any moisture on the chest, and a razor for shaving those with very hairy chests. Unlike regular defibrillators, an AED requires minimal training to use. It automatically diagnoses the heart rhythm and determines if a shock is needed. Some AEDs may be used on children - those under 55 lbs (25 kg) in weight or under age 8. If a particular model of AED is approved for pediatric use, all that is required is the use of more appropriate pads. All AEDs approved for use in the USA use an electronic voice to prompt users through each step. Because the user of an AED may be hearing impaired, many AEDs now include visual prompts as well. Most units are designed for use by non-medical operators. Their ease of use has given rise to the notion of public access defibrillation (PAD), which experts agree has the potential to be the single greatest advance in the treatment of out-of-hospital cardiac arrest since the invention of CPR. AEDs are becoming more common in public places, but they are not in enough places yet -- make sure you remind organizations that you and your family associate with of the importance of AEDs --- sports centres, private offices, and religious houses of worship are just a few.